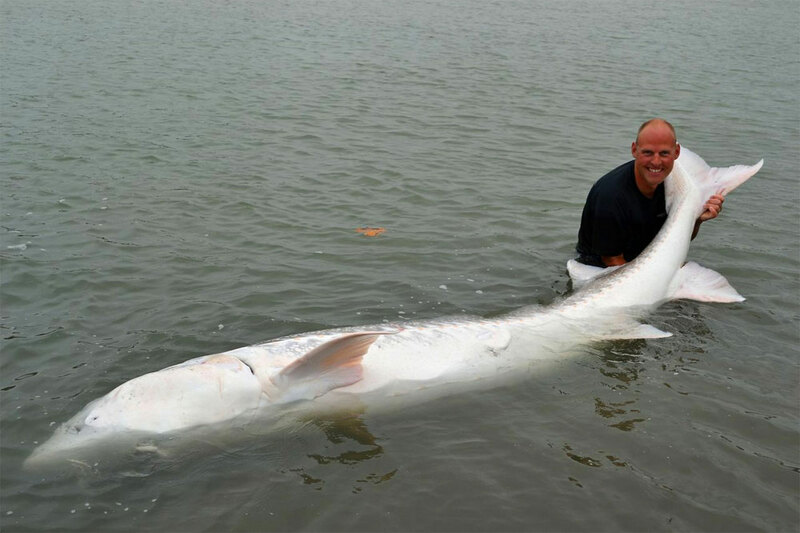 Catching a 1,000-pound sturgeon isn't supposed to happen very often. Try telling that to Great River Fishing Adventures, a charter company on the Fraser River who have now helped guide two groups to 1,000-pound white sturgeon in the span of just two months. 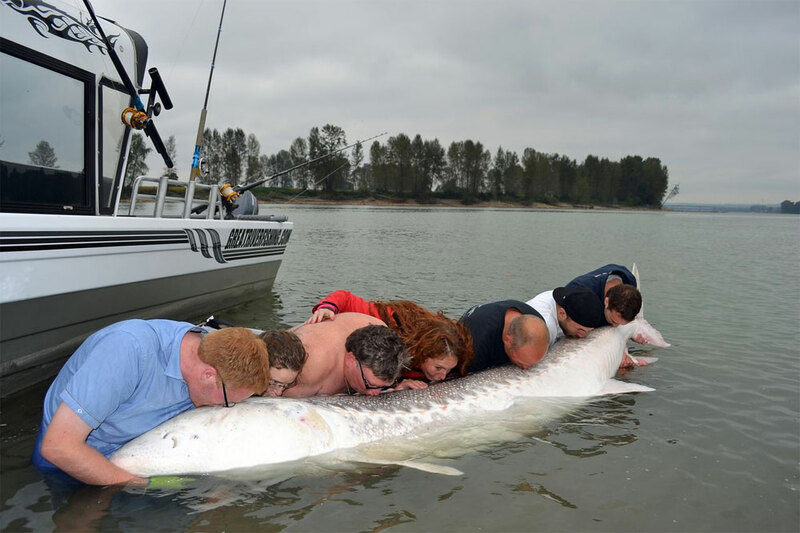 The first giant came on July 20 when Great River Fishing Adventures made international news headlines when British tourists Michael and Margaret Snell caught a 12-4 sturgeon on the Fraser River. Charts indicate that it weighed 1,100 pounds. It was released after it was tagged and photographed. Now, Fraser River is making headlines again as on Friday, September 21, a group of 30 anglers from a Kamloops accounting firm caught a 1,000-pounder on a team building fishing trip near Chilliwack. The firm's owner, Norman Daley, hooked the monster fish, which weighed five times more than him. The sturgeon was 11 feet eight inches long and had a massive five foot girth tape measured below the pectoral fins. Although impossible to weigh fish in the river, measurement charts indicate that the sturgeon would weigh about 1,000 pounds. "That thing was huge! In the first few minutes I had it on the line I thought my arms were going to fall off. Or I would end up in the river, said Norman Daley, Managing Partner of Daley & Company Chartered Accountants. Managing that fish became a true team effort. About 15 minutes into the battle I handed the rod off to my colleague. Then after another 15 minutes he handed it back. There was no way that one person alone was going to get that fish to the boat. It was truly a team effort." After close to 50 minutes the sturgeon was brought to shore by the boat's lead guide Jeff Welch of Great River Fishing Adventures. The crew scanned the fish to find it had not been previously tagged. It was dubbed a "virgin sturgeon," an untagged white sturgeon. Together with the Daley accountants, the team got in the water and measured the fish and applied a PITT tag to the left side below the head of the fish. Pectoral fin clippings were also taken for scientific study as it is considered an ocean migratory fish. With the sturgeon in the water, the group of anglers lined up behind it to pose for photos and videos to capture their once in a lifetime catch. Dean Werk, the owner of Great River Fishing Adventures, was on the water for both of the record catches. "It is really exciting to see another monster fish like this within such a short time period," he said, "and this second catch is proof that our conservation efforts have been successful and that this is a sustainable fishery." "We were looking for an opportunity for a team building experience, Daley said. This fishing trip brought us all together to celebrate a unique experience. It's something we'll never forget."